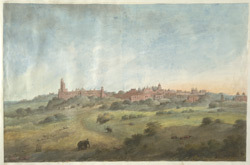 Panoramic view of the mosque and palace of Fathpur Sikri from 'Views by Seeta Ram from Tughlikabad to Secundra Vol. VIII' produced for Lord Moira, afterwards the Marquess of Hastings, by Sita Ram between 1814-15. Marquess of Hastings, the Governor-General of Bengal and the Commander-in-Chief (r. 1813-23), was accompanied by artist Sita Ram (flourished c.1810-22) to illustrate his journey from Calcutta to Delhi between 1814-15. In 1569, Mughal Emperor Akbar (r.1556-1605) moved his capital from Agra to Fatehpur Sikri and commenced the construction of the palace and fort. Built principally as a military establishment on the site of an earlier walled complex, the fort is considered the predecessor of the Delhi Red Fort. Visible on the left is the Jami Masjid (Dargah Mosque), the main congregational mosque at Fatepur Sikri, which was completed in 1572. The fort complex is on the right. Inscribed below: 'Futtipoor Seehnee'.